Hotel Krishna Niwas the Heritage House is one of the best resort in Mount Abu having the world class accommodation facilities and delicious mouth watering food service available in their own restaurant. They have three main types of accommodation options available for their guests. They are deluxe rooms, Suit rooms and Family room. All the rooms are well defined and fully furnished with all the equipments and facilities required for a most comfortable stay. All rooms are located in different area and on different floor and have its own charm. There are 10 well appointed A/C rooms – 4 Deluxe, 2 Super Deluxe & 4 Family Rooms, each room is unique and of different size . All the deluxe rooms are air-conditioned, spacious, well ventilated with wall to wall carpet and equipped with all modern amenities. All deluxe rooms are different from each other and are named as Mathura, Kunjvan, Dwarka, Gowardhan. Suite room have a sit-out, a dressing area, are air-conditioned, spacious, well ventilated with wall to wall carpet and equipped with all modern amenities. They are named as Chapiya and Vrindavan. Family rooms are perfect choice for a big family or a group. All the rooms are air-conditioned, spacious, well ventilated with wall to wall carpet and equipped with all modern amenities. They are Ayodhya, Gokul, Barsana, Muli. This property has its own pure vegetarian food and jain food restaurant, serving delicious delicacies of different cuisines. You can also dine in into the restaurant and you can also get your food ordered from your room and enjoy it in the room by room service. 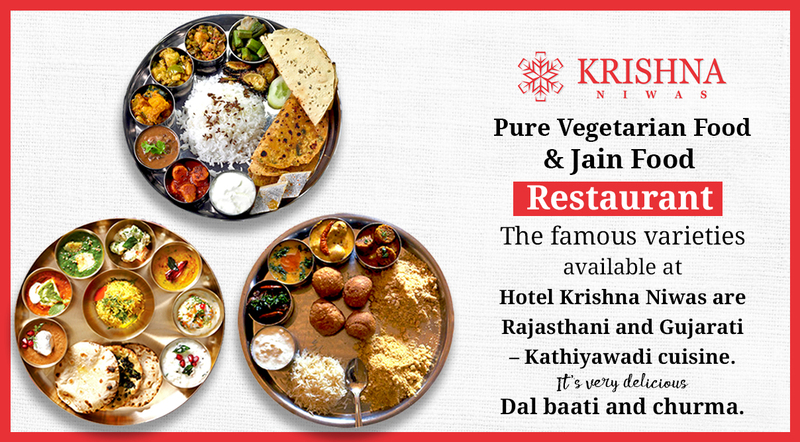 The famous varieties available at Hotel Krishna Niwas are Rajasthani and Gujarati – Kathiyawadi cuisine. It’s very delicious Dal baati and churma is available at Krishna Niwas. You can enjoy this special Rajasthani dish and get indulged into royal feelings with your loved ones. They also serve Kathiyawadi cuisine like sev tamatar sabji, baingan ka bhartha, lasaniya batata and many more delicious sabji which you can enjoy with tawa roti, gujarati bhakhri, rotla etc. Different kind of fast food and continental food is also available at the restaurant. The food quality is very good. They use fresh ingredients to prepare the food. They always maintain a very good hygiene practice in their kitchen and also the restaurant. Stay at Hotel Krishna Niwas to collect life long memories to cherish for. Hotel Krishna Niwas the Heritage House is so comfortable, cosy and relaxing that after time spent outdoors in and around Mount Abu, you can refresh yourself with a nice rest in your relaxing holidays. Calm and soothing ambience would definitely make you stay there again and again whenever you will plan a trip to Mount Abu.